Masumi Izawa is an energy-efficiency consultant in Portland, Oregon, USA with a background in social media market research and environmental psychology. She is the lead author of a myth-busting journal article on the Hawthorne Illumination Experiments–the experi- ments synonymous with the “Hawthorne effect.” On the side, she blogs about online dating. Friendster was all the rage back when I was being schooled on social science research methods in college. By the time I reached grad school and was studying social science research methods again, social media had become commonplace. It was also during this time that I began using social media and digital communication tools to complete grad school research projects, primarily out of efficiency and convenience reasons. This included using Facebook to recruit participants, Skype to conduct a focus group, an online dating site for a photo experiment, and Facebook to advertise a survey. Then after grad school, I joined a social media research group on LinkedIn and was spotted by the director of a future employer for a job as a social media and market research analyst. You could say that the digital+social sphere has had a pull on me. I’m an advocate for developing and adapting research methods to the digital+social age. 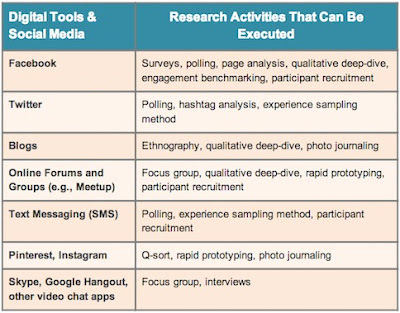 One of the best reasons to consider using digital tools and social media to conduct research is flexibility. Sure, digital+social methods currently lack the standards and rigor of academic research. However, digital+social methods allow flexibility in creating an original method unique to the research objective. At the moment, this flexibility in methods may be a better fit for real-world clients who have very specific and ever changing needs than for academia. Moreover, the flexibility in conducting research using digital tools and social media can lead to innovative, DIY research. An interesting example of this DIY research can be found in online dating. If you’ve ever googled for online dating tips and stories, then you’ve probably come across many data mining, experimental, and ethnographic research conducted by regular members of dating sites who just wanted better results; so they developed their own method for answering their dating questions. One of these DIY researchers gave a TED talk about it. Alongside flexibility in methods is the flexibility in recruiting participants using digital tools and social media. Perhaps the quickest and cheapest way to recruit participants nowadays is through social media. The market for smartphones and other mobile devices continues to grow, and these digital tools that are coupled with social media will be the primary ways through which many participants will be found and recruited. Research studies conducted in academia can finally recruit beyond WEIRD college students! What’s possible with the current digital tools and social media? To convince you some more about the flexibility and possibilities of research methods, here’s a matrix of some of the adaptations and applications of methods I’ve come up with so far. constantly evolve. And research methods should evolve too. Thank you for sharing of information for me. If you are interested in our services such as printed on the cup (in hình lên cốc), print detailed receipts (in phiếu thu chi), printed stamps warranty (in tem bảo hành), printed packaging (in bao bì), post-press (gia công sau in), print processing factory (xưởng in gia công), printed board (in áo), printing company (công ty in ấn), printed paper bags cheap (in túi giấy giá rẻ) we will give you. Searching for the Ultimate Dating Website? Create an account to find your perfect date.